In normal use, the eye’s natural enzymes completely and rapidly neutralize H²O² into harmless water and oxygen. In vitro studies of H²O² do not show the neutralization effect seen in vivo, as there are no natural enzymes present. Repeated dosing and patient's age have no significant effect on the eye's natural ability to neutralize H²O². Hypotonic formulation helps restore the hypertonic eye to its normal isotonic state. The by-products of preservative neutralization (water and oxygen) have no deleterious effects. Why use single dose units? The disappearing preservative in GenTeal makes it a safe, convenient and economical alternative to single dose units. 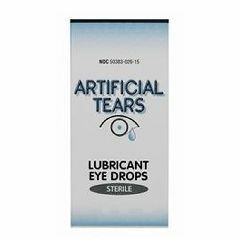 Can Artificial Tears be used as a moisturizing drop in eye that has a lens implant from cataract surgery?